If you’re an aspiring musician, making videos is essential in reaching a broader fan base. But you can’t capture your music with just any camera. You need one that records incredible audio. 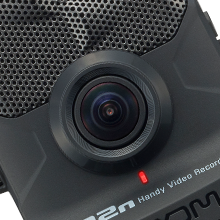 And the Zoom Q2n Handy Video Recorder is the only portable camera that has the power to do it. 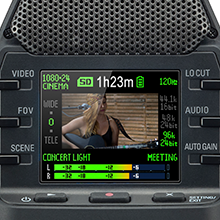 With built-in X/Y microphones, wide-angle lens, portable design, and a variety of lighting presets, the Q2n is capable of capturing great-sounding audio and HD video, no matter where you film—from rehearsal space to concert hall. The Q2n delivers studio-quality detail and clarity with high-resolution 24-bit/96 kHz audio. 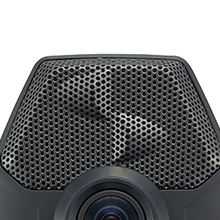 Its built-in X/Y microphones can handle high sound pressure levels (up to 120 dB SPL) for distortion-free recording. 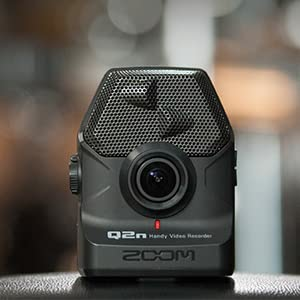 While traditional action cameras tend to fail in low-light environments like clubs and concert halls, the Zoom Q2n is designed to excel in these conditions. The Q2n includes 10 lighting presets that range from ‘Concert Lighting’—which automatically adjusts for changing light conditions—to ‘Concert Low-Light’ for dimly lit performances. And there are scene settings tailored specifically for filming in jazz clubs and rehearsal studios, as well as outdoors. A 160-degree wide-angle lens and bright F/2.0 aperture make the Q2n perfect for capturing video in a range of lighting environments. The camera records video in 720p or 1080p HD resolution with the same 24 fps or 30 fps frame rates used in film. 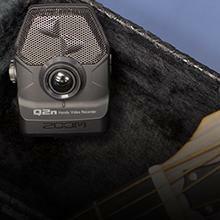 Small enough to carry anywhere, the Q2n is always ready in your backpack or guitar case when unexpected moments arise. It records up to two hours of footage with two standard AA batteries, so it’s great for recording at home, at rehearsal, or on stage. The Q2n is designed to be intuitive and easy-to-use. Simple one-button recording as well as straightforward controls make capturing high-impact audio and video effortless. 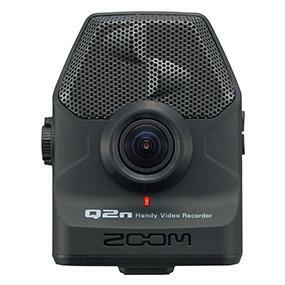 The Q2n is also capable of recording audio only. The ‘Camera Off’ setting lets you capture demos or live performances in high-quality stereo sound using the built-in X/Y mics.